You can make your own at home — once you’ve tracked down all the ingredients. To make Revel’s best-seller, you’ll need to have kimchi (the more sour, the better) and pork belly. THERE’S NOTHING quite like the craving for a Korean pancake. The combination of the crispy texture, salty taste, warm temperature and flavor-packed dipping sauces makes it undeniably attractive. Unfortunately, you can’t just run out to your local grocery store to satisfy that craving. So here’s how you can make Korean pancakes yourself. There are many kinds of Korean pancakes (called jeon), typically made with flour or mung beans. 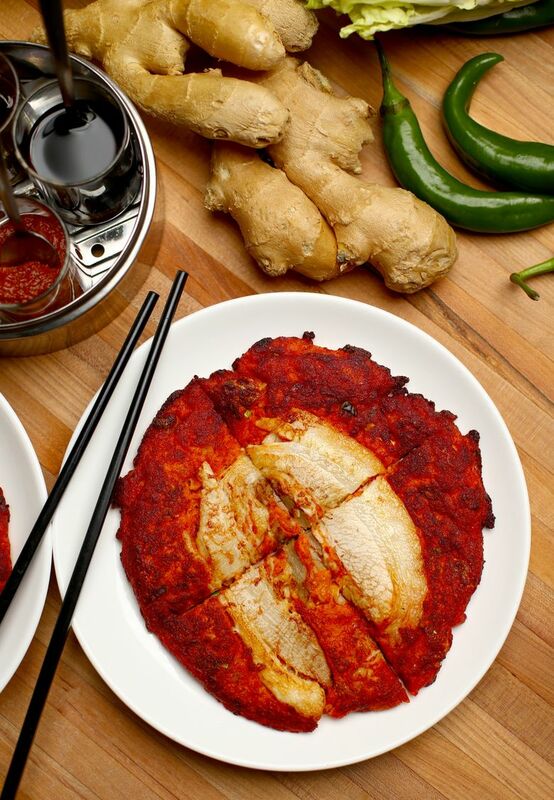 Savory pancakes are an important part of Korean dining, eaten as an appetizer or side dish. Some of my favorite Korean pancakes are from Revel in Fremont. Revel makes traditional mung bean pancakes (bindaedok) that possess an earthy nuttiness. The restaurant has three kinds of mung bean pancakes on the menu at all times: the best-selling pork belly and kimchi, a vegetarian version and a seafood option. Luckily for home cooks, the process is relatively easy once you have the necessary ingredients. Look for yellow shelled mung beans in bulk sections or at Asian markets. Beans are soaked in water and then processed into a puree. Then scallions, bean sprouts, kimchi and seasonings are added. This is one pancake that’s naturally gluten-free. At Revel, which Yang runs with her husband and fellow chef Seif Chirchi, pancakes arrive with a tantalizing selection of four sauces: sweet chili, soy-ginger, spicy fish sauce and savory. At home, serve them with your favorite sauce. You might just want to keep slices of the braised pork belly in your freezer, because you never know when you might be overcome by an irresistible craving. 2. Place all ingredients in a pot, cover and bring to a boil. Transfer pot to oven. 3. Braise pork for about 1 hour or until tender. Pork should be very tender but not falling apart. 4. Remove the pork from the pan and cool. 5. Slice about 1/8-inch thick for pancakes. Save remaining pork belly for another use. 1. Soak mung beans with 1 cup of water for about 1 hour. 2. Drain soaked mung beans, rinse and puree with 1/3 cup of water until smooth. 1. Mix everything together except the canola oil. 2. Heat an 8-inch nonstick sauté pan with 1 tablespoon of canola oil over medium heat. Add about 2/3 cup batter, and spread evenly. Add a slice of pork belly on top of the pancake. Cook until the bottom side is golden brown, about 2 to 3 minutes. Flip and cook the other side until golden brown. Repeat with the remaining oil, batter and pork belly slice. Serve with your favorite sauces. Catherine M. Allchin is a Seattle food writer. Follow her at catherinemallchin.com. John Lok is a Seattle Times staff photographer.